That was the start of one of the greatest careers in sports, and that’s how Pele the author starts the introduction to his book — recalling the pure joy of the game. 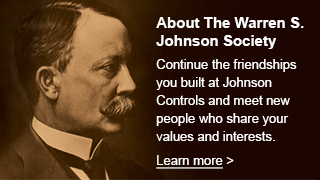 I’ve been a bit too serious lately, my monthly articles and the books I’ve read seem a bit heavy or technical. When I ran across this book, I immediately put all those aside to learn more about Pele, his life and experiences. 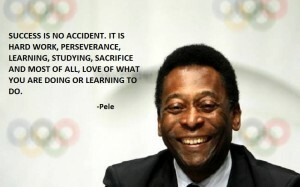 With Brazil hosting the games this summer, it’s only natural that Pele’s story is brought up to date. The last time Brazil was host, 1950, they lost in the final game to Uruguay, an upset viewed as a national disgrace. It did however, serve to set the stage for Pele and World Cup Sweden 1958. For those of you who may not know about him, Edson Arantes Do Naciemento, Pele, broke onto the world stage at the World Cup 1958 in Sweden. 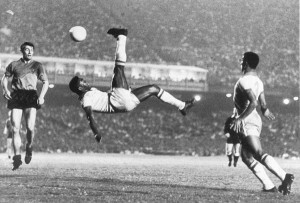 Pele, Garrincha, and Didi led the Brazil National Team to victory over host Sweden , 5 to 2. And, they did it such an artful way that by end of the game, even the local crowd was cheering them on! His accomplishments continued to get better from there. 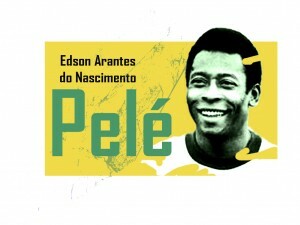 During his career he was declared a National Treasure by Brazil, not available to teams in other countries. Towards the end of his playing career he joined the New York Cosmos to promote the sport of soccer in the United States, and continues to be an ambassador for soccer around the world. I never saw him play, but in press interviews he always struck me as someone who just enjoyed what he did and wanted others to enjoy it as well. And, though he was the best in the world, he was always humble in his successes. I’m really looking forward to reading his book. This one is not to be speed read. I plan on taking my time with it, learning as much as I can and enjoying every experience he shares. ” You’re just a boy. . . . You haven’t done anything yet. Not a thing. When you’ve accomplished something, one day, then you can celebrate. But even then — you’ll do it with humility.” . . .words from his father, Dondinho who caught him showing-off his skills while playing with friends. 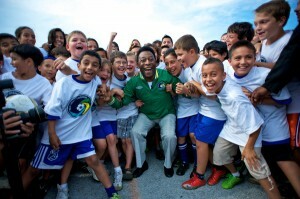 Doing a Bing Image search on Pele, returns over 54,000 images, over 16,000 images of Pele with children. He’s long retired from playing the game, but he continues to be a world ambassador for soccer and, I think, for a fulfilling life, doing something we love, with enthusiasm, for others to enjoy. Sounds like a good formula to me. I’m really looking forward to the rest of the book, and, of course, to the World Cup this summer. It’s going to be something special.